Here’s what’s happening in the world of television for Wednesday, January 16. All times are Eastern. 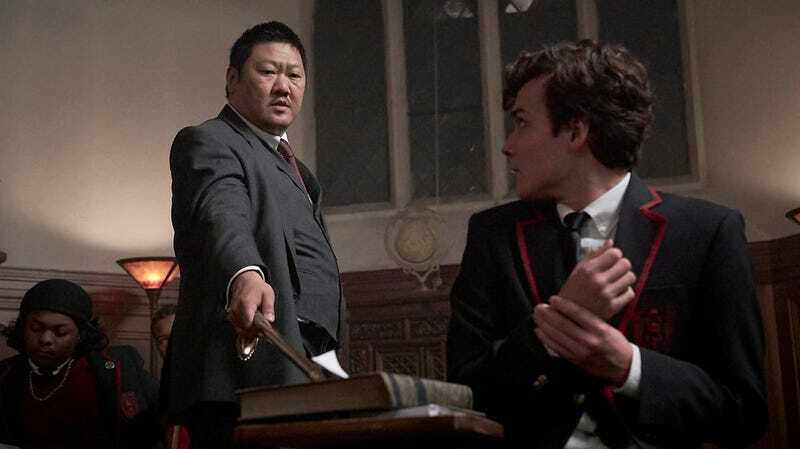 Deadly Class (Syfy, 10 p.m., series premiere): Hogwarts, but with knife-fans. Brakebills Academy, but with the Yakuza. Riverdale High, but Henry Rollins teaches poison class. Mean Girls, but Cady Heron’s a homeless kid who may or may not have killed a bunch of orphans by lighting a group home on fire, and Regina George is a stone-cold murderous white supremacist. You get the idea. Deadly Class will feel familiar in any number of ways, but there’s a very sharp-edged twist: Do a bildungsroman, but make it really stabby. That’s not a complaint, mind. We’re interested in Deadly Class, Syfy’s adaptation of the Image comic of the same name, for reasons beyond the twist-on-a-trope thing it has going. For one, it’s from the Russo Brothers, who know a thing or two about comic book adaptations and here serve as executive producers. For another, it’s got an interesting cast, including the terrific Benedict Wong as the Dumbledore of the operation, To All The Boys I’ve Loved Before’s Lana Condor in motorcycle-riding, katana-wielding, overachieving mode, and a bunch of promising relative newcomers. And just to seal the deal, we’ve got Brian Tallerico’s recaps to look forward to. Starts promptly at 10. There will be a quiz, and possibly a disemboweling. Schitt’s Creek (Pop, 10 p.m. and 10:30 p.m., fifth season premiere): Schitt’s Creek is back! Do you need more than that? It’s a very good, very funny, surprisingly affecting show starring two comedy giants and containing one of 2018's best performances. We do not feel the need to explain more. If you’ve not yet met the Roses, there’s no time like the present. If you have, you’ve stopped reading this entirely and are just watching the trailer again. That’s what we’re doing, after all.